Ygfa is a Nord healer serving the Imperial Cult at Fort Pelagiad. She sells ingredients, potions and spells to all who need them. Ygfa is one of the people you can speak to if you wish to join the Imperial Cult. If you finished The Silver Bowl quest, she will make you a member of the Cult for free. If you are a member, you can ask her for a promotion if you've earned it. She is somewhat involved in The Silver Bowl quest, during which she will tell you where to find the bowl's proper owner, although the quest can be done easily enough without ever speaking to her. Ygfa is also very knowledgeable about all manner of magic as well as the various diseases you may encounter in Vvardenfell. 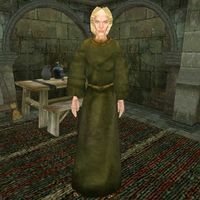 Ygfa is a restocking vendor for the following ingredients: Ash Yam, Bittergreen Petals, Chokeweed, Guar Hide, and Marshmerrow. "Blessings of the Nine, %PCName. I am Ygfa, Fort Pelagiad's Healer, and an Adept of the Imperial cult. I barter for potions and other goods, and can teach a number of spells. All proceeds go to the benefit of the Imperial cult and its many worthwhile projects. Would you like to join the Imperial cult?" The Silver Bowl: Return this silver bowl found in a smuggler's cave to its rightful owner. Ygfa's version of Turn Undead, Blessed Touch, is arguably the best in the game for the cheap cost of 5 Magicka. This is actually the same spell given to those born under the sign of the Ritual. However, the spell is not assigned to any school of magic, and thus casting it will not improve any of your skills. This page was last modified on 23 November 2018, at 07:27.